Guy lives in the UK but celebrated his Bar Mitzvah here in Israel in the summer. His Mum and Dad, dear friends of ours, were keen for me to create the artwork for his celebrations, as I had done for his sister three years earlier. After a family Bar Mitzvah meeting, I was given a list of suggestions for the artwork. 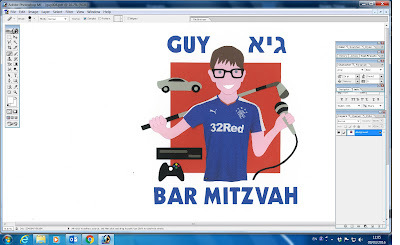 They included showing Guy with his black rimmed glasses, a Glasgow Rangers football shirt, a thistle (Dad is Scottish), a microphone and/or music notes (or anything else to represent singing and performing), his Xbox, a Jaguar car and golf. Plenty to work with! 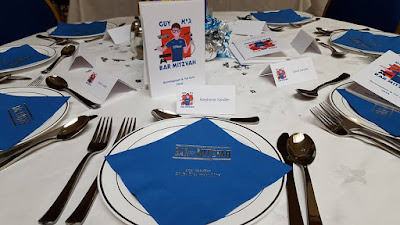 The artwork was needed for celebrations both in the UK and in Israel, so I was asked to include Guy's name in English and Hebrew, and the word Bar Mitzvah. A date, it was decided, would only be confusing since the lucky young man was having two celebrations! 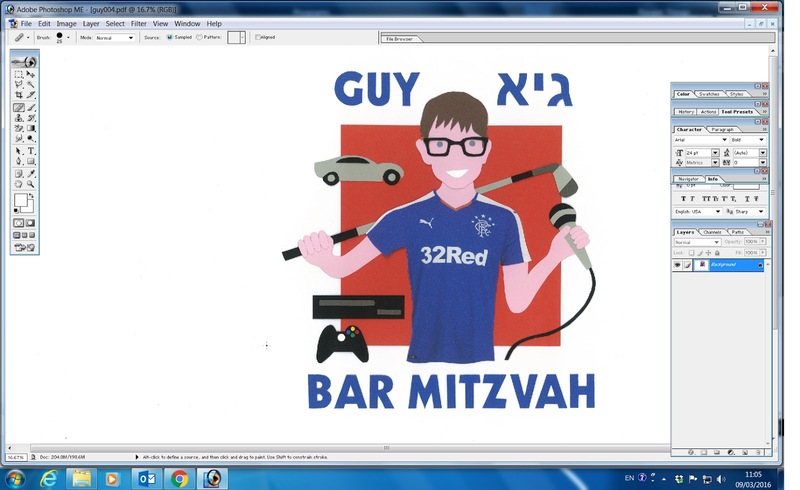 In my sketch, and the subsequent artwork, I have shown Guy in a blue Rangers shirt, wearing his black glasses. He has a golf club in one hand (swung behind him) and a microphone in the other. The Xbox and controller are to his left, and over his shoulder is a fast car. The thistle ended up inside his Bar Mitzvah album. Since the football shirt is bright blue, I suggested a red background and the lettering I made a darker blue to match the shirt. I added his name in both Hebrew and English and the word Bar Mitzvah in bold lettering. Guy's parents were really pleased with my illustration and Guy himself loved it. "I can't believe how much it looks like Guy!" his Mum wrote. "Thanks Lisa. The artwork is amazing and the likeness to Guy is incredible. I can't believe how well you get all the attributes that make up Guy and his personality into the artwork. Another success to add to your portfolio." * This post has been shared on Blue Monday. the detail on the shirt is amazing. glad they loved it! How special. And great preview of your process. I love it you choose a red background. That is really nice! The lettering is also great and good to read so in darker blue. Are the blessing books also in English or only in Hebrew. It is perfect artwork. Love your style!